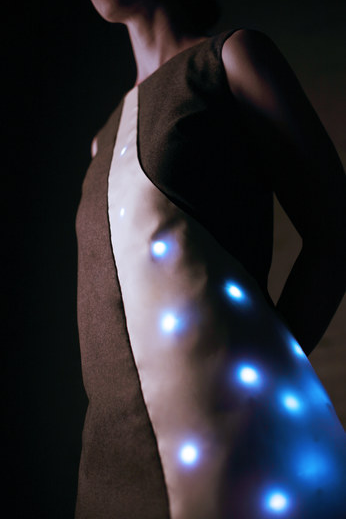 Neopixel Shibori Dress Powered By Flora #WearableWednesday « Adafruit Industries – Makers, hackers, artists, designers and engineers! Adafruit forum user Dieterk’s first post on our customer forms appeared on July 1st. I think it’s amazing that in just two short months he created an impressive dress using Flora to power NeoPixels embedded in layers of shibori silk. If you like his work, vote for it in the MIT Descience People’s Choice contest. If you are shy about joining the forums, you’ll find videos to answer many commonly asked wearables questions on our YouTube channel.